It may seem, at first glance, like a typical summer scene. 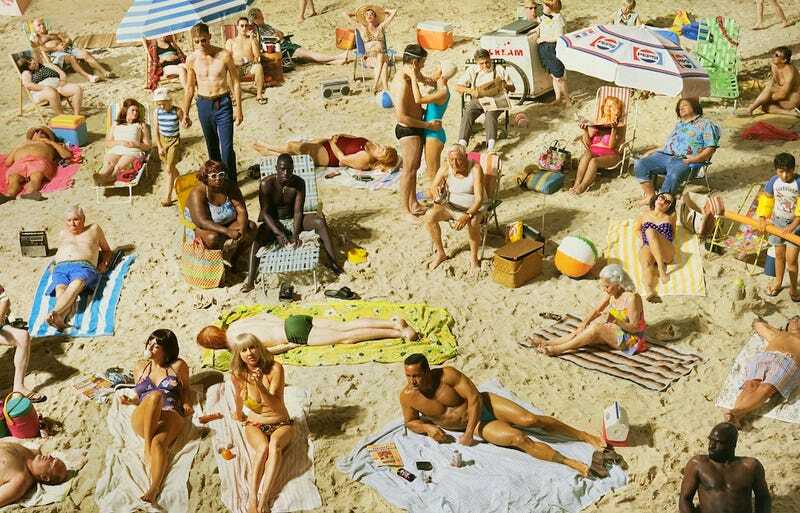 But the photographs of busy beaches, airports and public buildings by Alex Prager are actually elaborately choreographed images. A new exhibition, Alex Prager: Face in the Crowd, features large-scale color photographs that capture her glorified versions of simple human interaction. For Prager, a photograph requires directing extras to create narratives with their body language—telling hundreds of stories within a single photo. What I love about Prager's photographs is that she is essentially creating these perfect little vignettes of how we imagine public space should be. Even the images of the crowded spaces, where you can almost feel a stranger breathing on your neck, capture a sense of energy and bustle that we can only get in a vibrant public place. With their brightly costumed subjects and aerial perspectives, the photos also have a certain Where's Waldo? quality to them, where you feel like you can study them for an hour and still not have seen each visual detail. "I'm fascinated by the experience of being involved in other people's lives accidentally," Prager said in a statement. "Crowds have always been an interest of mine. It may look like a sea of people, but there are so many interesting stories, all colliding silently." The photos are even more impressive when seen at actual size. I also love the trompe l'oeil effect of the photos. Even though the fashion is vaguely Mad Men-adjacent, it does take a few minutes for your brain to decide if each photograph is indeed staged or not. The dead giveaway? Not a single smartphone.